Long time no speak! Sorry about that, guys. Last Sunday marked two months to the Big Day and I must say, things are certainly gathering steam. Unfortunately that means less time for the grocery store, much less for the kitchen. I did, however, attempt a dish this weekend I’ve been meaning to try. The bright yellow color and fragrant dill sounds like such a great combination I was really looking forward to Cha Ca Thang Long, Vietnamese fish with turmeric and dill. Everyone must have been in the mood for the fried yet light, buttery fish Palmburo or chim (cheem) this week, or else it was on special at the market. 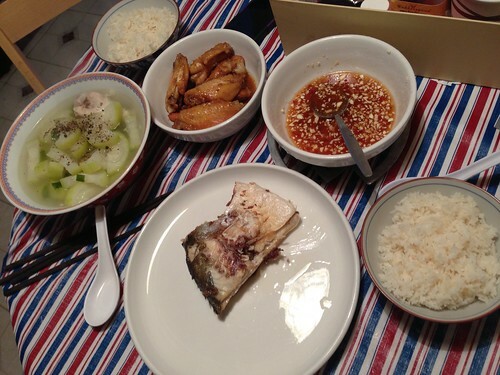 Ma prepared the dish for us after work and sent me home with two fish to make later. I’m still not great at frying things, but this went a bit easier. Preparation is simple – give a good rub down with iodized salt to clean inside and out of the fish, and rinse thoroughly. Slice each side of the fish for more even cooking. Pour vegetable oil in a fry pan and heat well. Drop the fish in and cover loosely to fry for about 7 minutes each side. I like this fish because the bones are larger and easier to remove. 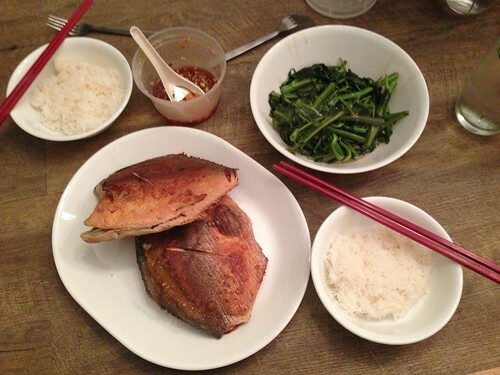 While the last fish was on its second side, I prepared the leftover rau muong water spinach with fermented tofu. 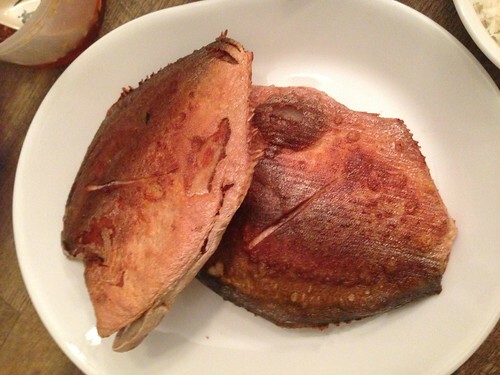 So easy and flavorful – a really nice compliment to the fried fish. Start with some oil in a wok or stirfry friendly pan and add 2 cloves garlic until fragrant. Then add 2 – 5 blocks of the fermented chili tofu (we like more…), breaking up with a wooden spoon until soft. Then add the rau muong and toss to cover. It doesn’t take long for the greens to cook down and soften. Serve with rice and you’ve got a quick (under 30 minutes) and inexpensive (under $8 for t wo) meal. Take that, Rachel Ray. So what’s this third way, you ask? Later in the week we went over to his brother’s house after hanging with our nieces and much to our surprise what’s for dinner? Why ca chim, of course! They fried the fish in a stock pot filled higher with oil and tossed them both at the same time. Smart, actually. Although you use quite a bit of oil this way. 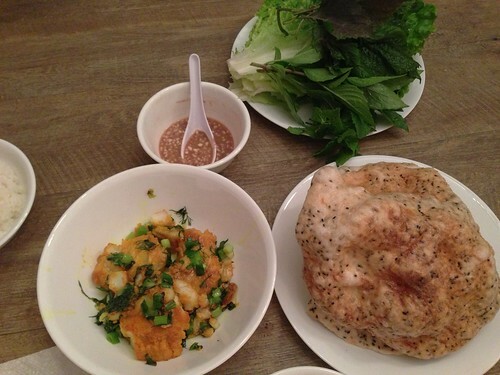 To serve, they made a bed of rau muong for the fish and spooned the nuoc mam on top instead of dipping separately. I like both but may favor the greens with fermented tofu to balance the sweetness of the nuoc mam. 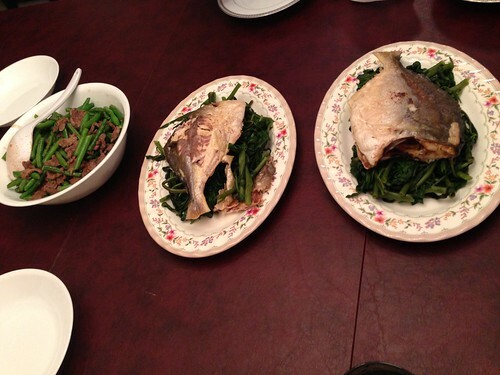 To accompany the fish, they made an easy stir fry with flank steak thinly sliced and fresh green beans. The stir fry seasoning is easy with Oyster Sauce, Mushroom seasoning, sugar and pepper. All, of course, to taste. So really the “3 ways” are very similar, mostly differing in presentation and accompaniments All of them are damn good and easy. So give it a try!